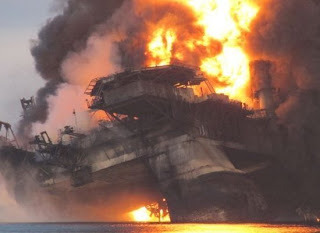 On April 20, 130 miles south of New Orleans a BP exploratory oil well blew out, igniting the Transocean Deepwater Horizon offshore oil platform in a fireball, killing 11 workers and critically injuring 3 others. The platform burned for two days before sinking. Initial reports were phrased to reassure, dismissing concerns of any leaks, but the timeline shows the failure of damage control both to the environment and to public perceptions. Nearly a mile below the surface oil continues to gush from the well head. Estimates have been revised upward from nothing, to 1,000 barrels per day (BPD) to the current official number of 5,000 BPD, and much larger numbers are not being refuted. 700,000 gallons of diesel fuel used on the platform also either burned or went to the bottom. The worst-case scenario for the broken and leaking well pouring oil into the Gulf of Mexico would be the loss of the wellhead and kinked piping currently restricting the flow to 5,000 barrels -- or 210,000 gallons -- per day. If the wellhead is lost, oil could leave the well at a much greater rate. The exact cause of the original eruption is still unclear, and may never be known with certainty, although initial suspicions focus on failure of the blow-out prevention equipment and the concrete used to seal the well head. It's happened before. Last August in the Timor Sea near Australia the Montara oil leak and environmental disaster took months to staunch and multiple attempts. Here too the oil company involved (PTTEP) downplayed the problem initially, even going so far as to dismiss the oil slick as merely "discolored" water from natural effects. Their estimate of 300 BPD of spillage may have really been more like 2,000 BPD. While it appears similar, the final cause has not yet been officially determined. Cutting corners to save time and costs, i.e. greed, is the prime suspect. Hearings have been held for the past two months; the final report was originally due last week, but its delivery schedule is now unclear. There is a long history of oil spills, including from platforms in the Gulf of Mexico. [The] widespread pattern of unapproved design, testing and inspection documentation on the Atlantis subsea project creates a risk of a catastrophic incident threatening the [Gulf of Mexico] deep-water environment and the safety of platform workers. The extent of documentation discrepancies creates a substantial risk that a catastrophic event could occur at any time... There is no valid engineering justification for these violations and short cuts... BP's recklessness in regards to the Atlantis project is a clear example of how the company has a pattern of failing to comply with minimum industry standards for worker and environmental safety. "It should be seen as a process failure, a cultural failure and a management failure," John Mogford, then BP's senior group vice president for safety and operations, said in an April 2006 speech about the lessons learned in Texas City. "It's not an easy story to tell. BP doesn't come out of it well." It’s a tragedy, but at the end of the day we are not going to stop doing things that need to be done. Clearly, it should also be seen as criminal, sociopathic behavior. "A striking feature of the incident is the apparent lack of an adequate plan to contain the spreading environmental damage," the lawmakers wrote. They said they are investigating "what the companies knew about the risks of drilling at the site and the adequacy of the companies' response plans." They can't turn it off, they don't know how to. BP as much as admitted their failure to prepare in recent days as they appealed for help from rivals, the government, or, well, anyone. They had no plan. In a letter published on the U.S. government Web site Regulations.gov, Richard Morrison, BP's vice president for Gulf of Mexico production, wrote that while BP "is supportive of companies having a system in place to reduce risk, accidents, injuries and spills, we are not supportive of the extensive, prescriptive regulations as proposed..."
Mr. Morrison noted that BP had already adopted policies that complied with the MMS's proposed new rules. But he challenged the need for companies to file regular audits of their safety programs with the agency, saying that would be "an administrative burden." BP's recklessness in regards to the Atlantis project is a clear example of how the company has a pattern of failing to comply with minimum industry standards for worker and environmental safety. Significant doubts remain in regard to the ability of this type of system to provide a reliable emergency back-up control system during an actual well flowing incident. However, a spokeswoman for Norway's Petroleum Safety Authority said the switches have "been seen as the most successful and effective option" in North Sea usage. Several oil producers, including Royal Dutch Shell, sometimes use the switch even when it is not required by country regulations. The federal Minerals Management Service has recorded more than 500 fires on platforms in the gulf since 2006. At least two people have died in gulf platform fires over the last four years, and about 12 more were seriously injured before the accident on the Deepwater Horizon. No accident so far has measurably slowed the rate of discovery and production. Many people recall the Exxon Valdez disaster in Alaska's Prince William Sound, which spewed 250,000 barrels of oil, devastated the local economy and took years and billions of dollars to clean up. Some of the oil is still there. Exxon successfully stalled, appealed, and wrangled over being held legally accountable for the original judgment (amounting to one year of its then current profits,) outlasting and exhausting many of the plaintiffs. BP has its eyes staring at its shoes right now, but does anyone think the corporate modus operandi will be different here? What will likely be different is the scope of the devastation. The Exxon Valdez spill was limited, if that's the right word, to what was in the tanker. 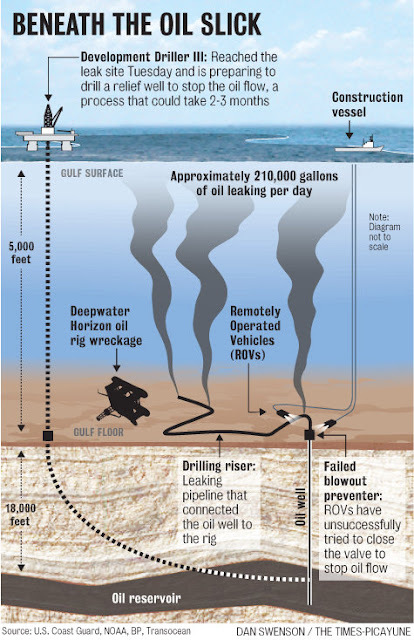 The BP spill is limited only by the unknown size of the underground oil field. If the current 5,000 BPD estimate is correct, the spill will exceed that of the Exxon Valdez before the end of June, since there is scant likelihood of the well being plugged before then. If the higher estimates are correct, it is already worse. Continuing business as usual makes economic sense for the oil companies. They reap enormous profits in part by paring costs on such things as environmental and worker safety. Many of the accidents result in costs or fines that are smaller than the costs of prevention. If the worst happens, and their is a huge disaster, they merely play meek until the furor dies down, and then use attorneys to wear down the litigants. It's nothing personal; it's just business. They book the rewards and the public pays the costs. The picture would look very different if they had to account for the full environmental costs. Laissez failure. Over the course of 30 years federal regulatory oversight bodies have been vilified, starved for funding, and vitiated in their effectiveness through sustained ideological attack. The resulting atrophy has left them unable to protect the public interest, not just in the environment but in areas from food to finance. How confident can we be that this will change in any meaningful way? Not very: federal regulators permitted expansion of drilling on the Atlantis project despite the lack of required documentation or procedures. We believe the industry's current safety and environmental statistics demonstrate that the voluntary programs... have been and continue to be very successful. Nothing that is occurring now in the Gulf, nothing that even could occur, will change this view. The associated libertarian view that regulations should be voided because they are inimical to American freedom is overly simplistic. Rules of the road provide "more freedom in the form of a greatly enhanced ability to get wherever we want to go quickly and safely." In other words, freedom isn't the same as anarchy, and regulations prevent the anarchy of unrestrained individual action that can result, as we see here, in death and destruction. Energy policy implications. Just in the last month the Obama Administration announced support for renewed offshore oil and gas drilling. The moratorium has been quickly restored until the investigation is complete. There will of course be many investigations, and for now supporters of offshore drilling are mostly laying low, waiting for events to pass and outrage to ebb. Meanwhile, some are suggesting that the entire climate and energy bill could be threatened. This seemingly nonsensical result is solely because the support of some Senators hinges on increased largesse and advocacy for offshore drilling. Perversely, the massive environmental disaster in the Gulf has not reduced support for the ecological nightmare of offshore drilling by its supporters, but only reduced the possibility of acquiescence by those already dubious of its safety. In other words, support for offshore drilling hasn't changed, but rather only the willingness to be on the record supporting it. Our legislators are cowards, unwilling to be accountable to the truth and to vote accordingly. In a rational world, where policy is formulated on the merits, undistorted by the fossil industry's campaign cash, our legislators would remove offshore drilling from the energy bill and focus instead on sustainable energy solutions without such massively deleterious consequences. In short, it would be what it should always have been--legislation building our energy future through renewable technologies. It would not diminish support, but serve to shape a better piece of legislation more fully informed by the hard realities of science, technology, and the practical limits of our own cleverness as a species. Interior Secretary Ken Salazar this past week gave final approval to Cape Wind after a near-Odysseian 9-year process. It's worth pausing for a moment to ponder why this took so long. Opponents, frequently aligned with fossil interests, claimed all kinds of terrible outcomes would occur: bird deaths, destruction of the marine environment, loss of fisheries, impaired views. And yet, in a classic case of projection, these are the precise outcomes washing ashore with the oil all along the Gulf Coast. How is it that our discussion of the environment has become so warped, so detached from reality, so lacking in perspective, that we can approve offshore drilling, mountaintop removal, tar sand projects, so-called shale plays and other mortal assaults on our habitat, yet we struggle to allow offshore wind, solar arrays in the Mojave, or any number of other renewable projects because of vague and generally unsubstantiated worries? Finally, do the now-hollow promises of the oil industry about the environment, safety, and so forth give anyone pause as we contemplate a revival of nuclear plant construction? Same rhetoric. Do we want to find out whether we will get a different result? The offshore oil industry will not change unless it is forced to do so. Neither will coal. Or nuclear. Unless and until there is a vigorous, robust and sustained re-commitment to regulation based on the primacy of the public interest no further approvals should be given. The alternative is nothing short of criminal negligence if not rank corruption. The politics of blame and hypocrisy. Political posturing wasn't long in coming, and its transparent mendacity is equally unsurprising, as is its intended effect of diverting attention. First, despite Obama's foolish and ill-timed embrace of offshore drilling, this is not "his Katrina" unless the phrase is meant only as a test of his ability, unlike the feckless W, to respond. Hurricane Katrina was a natural disaster which we could not prevent, but to which we could only respond. This disaster was eminently preventable, but the weight of ideology and casino capitalism marginalized anyone advocating measures that might have done so. So far the federal response appears concerted, but I doubt even all the king's horses and men will be enough. Second, suggestions of some kind of conspiracy where opponents of offshore drilling deliberately sabotaged the platform are scurrilous and without any foundation. Some making such wild accusations have long lacked credibility. Attempts to blame liberals, Democrats, etc. are fact-free partisanship and have no place in a discussion amongst adults looking for pragmatic solutions to the current crisis and lessons to apply in preventing future ones. Third, all snark aside, it's essential to ask, how's that oily drilly thing working out? There's a lot of talk about accountability these days. You hear it being applied to those collecting unemployment benefits. To borrowers in underwater mortgages. To unwed mothers. Sometimes, fleetingly, from a few quarters, to those who tanked the economy. Is it not time, at last, to talk about accountability to the oil industry? To those poo-pooing the potential for environmental destruction? To the advocates of "drill here, drill now" and "drill, baby, drill"? To those, like Governor Jindal, who decry federal spending until it is spent on something he wants? To the media which shirks its obligation to demand such accountability? The first federal investigation (of what will doubtless be many) has begun. Will there be true accountability and an honest inquiry? Or, will scapegoats be fingered and rationalizations based on supposed economic necessity trump truth, paving the way for a return to business as usual? Lather, rinse, repeat. An ancient piece of Wiccan wisdom says that one is repeatedly presented the same lesson, often in harsher form, until it is learned. The cost of our intransigent ignorance increases. Let us learn.